The in-game sprite of Sheriff from Sheriff. Sheriff (シェリフ, Sheriff) is the protagonist of the 1979 Nintendo arcade game of the same name. 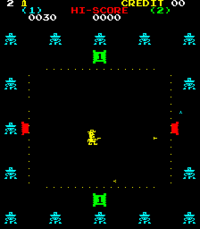 Screenshot of the arcade game Sheriff featuring the titular character. In the original arcade game, the titular Sheriff has to defend a plot of land from sixteen bandits, who move around the edges of the territory while firing at Sheriff. Sometimes the bandits also enter the land so Sheriff has to dodge the bullets and the bandits while attempting to return fire. Once all sixteen bandits are defeated the level is won. The Sheriff Assist Trophy's movements are a facsimile of the original game's control scheme which involved two joysticks, one for which direction to walk and the second for which direction to fire Sheriff's gun. In the sequel the second joystick was replaced with a button, so Sheriff could only shoot in the direction he was facing. Sheriff only appears as a trophy. Sheriff is a game with a particularly long history, even among other classic Nintendo arcade games. You aimed the sheriff's gun by way of an eight-directional dial controller, which you would depress to fire. The goal of this frontier shooter was to protect the territory from various scoundrels and ne'er-do-wells. Sheriff in Super Smash Bros. for Wii U. Sheriff appears as an Assist Trophy in both Super Smash Bros. for Nintendo 3DS and Super Smash Bros. for Wii U. When summoned, he moves around choppily and fires in any of eight directions at opposing characters. The shots deal 14% damage and can be reflected, but not absorbed. Sound effects from Sheriff play as he moves around. If he takes 30% damage, he'll be defeated and stay on his pose when he is shot by one of the bandits, and then he'll disappear. The Sheriff trophy appears in both versions. In Super Smash Bros. for Wii U it is part of the Memorabilia Trophy Box. This arcade game was released in 1979 in Japan. The game used an eight-direction joystick and a switch to control the title character. In Smash Bros., the sheriff will appear in his original glory and fire in eight directions. The bullets are tough to dodge, and they pack a serious punch. This arcade game was released in Europe in 1980. The game used an eight-direction joystick, and a switch to control the title character. In this game, the sheriff will appear in his original glory and fire in eight directions. The bullets are tough to dodge and will really knock your socks off. Sheriff retains his role as an Assist Trophy, and acts similarly to how he does in Smash 4. In this game, however, his bullets can no longer be reflected and shielding them will cause him to shoot more at a rapid rate until the shield is broken or the target is hit. Training Mode describes his Assist Trophy: Moves around, firing a gun in eight directions. Sheriff in Super Smash Bros. for Nintendo 3DS. Sheriff when defeated in Super Smash Bros. for Nintendo 3DS. Sheriff is one of the oldest Nintendo characters to appear in the Smash Bros. series, predating Mr. Game & Watch and Pac-Man by a year. However, he is not the oldest entity in Smash; with the Color TV-Game 15 being older. Depending on whether one considers the Color TV-Game 15 a "character" in its Assist Trophy role, Sheriff can be considered the oldest character in the game. This page was last edited on April 17, 2019, at 03:47.